Is there anyone more afraid than a mother who is afraid for her child? When unusual symptoms start to appear, and a mother makes the decision to approach a physician, she hopes to be told that the problem is transitory, or is easily cured. She tries not to show fear to her child, but in the back of her mind is a silent terror of the unknown. In 1963, a mother in northern New Jersey began to observe in her son Michael behaviors which concerned her. A healthy eight year old, he began walking into trees, and even crashed his bike into a tree, He walked into a moving car. His mother described his escalating symptoms as "bizarre.” Eventually, he broke his front teeth in an accident, refused to play ball with his older brother, and the other children nicknamed him "butter fingers". His central vision was degenerating. She took her son to an ophthalmologist who observed black pigment in the area of the macula. As the black areas increased, he was diagnosed with bilateral macular degeneration and declared legally blind in 1963. The physician who declared him legally blind told the parents that eventually the entire macula would be blackened and the boy would be totally blind. The silent terror of a mother was made flesh. At this point in the illness, a little known Ruthenian nun from our own Byzantine Catholic Church entered the story. Sister Miriam Teresa Demjanovich was baptized and chrismated at our parish in Bayonne, New Jersey at the beginning of the twentieth century 1901. As she herself said, "The real beginning of my life, the life of the spirit, occurred five days after my birth according to the flesh. I was baptized and confirmed in the Greek rite on the thirty first of March, a Sunday, truly a day of resurrection." After high school, she went to college and earned a Bachelor degree in literature at College of St. Elizabeth, Convent Station, New Jersey. At this point in history, a small percentage of people went to college, and even fewer women earned a Baccalaureate degree. This highly intelligent woman then went on to dedicate her life completely to God by entering the Sisters of Charity in 1925, one of the communities founded by Saint Elizabeth Ann Seton. 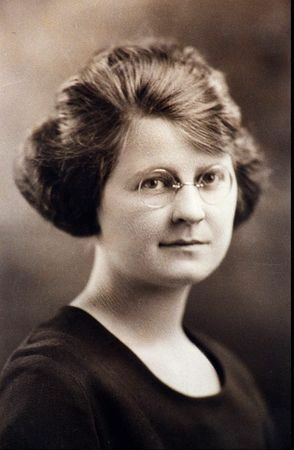 Sister Miriam Teresa died on May 8, 1927 at the age of 26. Although she was allowed to take her final vows just before she died, she never changed rites and died a Ruthenian Greek Catholic. The people close to her suspected that she was a saint and a mystic, a special intimate friend of Our Lord. During her short time as a religious, she wrote a series of spiritual conferences that were presented without her name on them. Her authorship was revealed after her death, and, after their publication in 1928, they quickly became a bestseller in the American church. Now you may be wondering how a Ruthenian Byzantine Catholic nun who died 40 years earlier might be involved in the blindness of a young boy in the 1960's. The Roman Catholic Bishop of Paterson, New Jersey proposed Sister Miriam Teresa for canonization in 1945, and the sisters at Michael's school were promoting devotion to her. When she heard the news of Michael's blindness, his third grade teacher Sister Mary Augustine gave Michael a leaflet on Sister Miriam Teresa and a piece of her hair, that is, a first class relic. The mother recalled when he gave her the leaflet and relic that she had a feeling that everything would be OK.
Michael 's family moved to southern New Jersey about a month after the last visit to a physician and two weeks later Michael was taken to Wills Eye Hospital in Philadelphia. The examination showed this eyesight was normal, and he recalls that he could ride his bike again when they moved. There was no doubt. It was a miracle-just like the one we read in St. John's Gospel a few weeks ago. Several doctors agreed that he was blind from macular degeneration, and four ophthalmologists testified that there was no known case of a cure such as this. As the George Gershwin song says, "The age of miracles had not passed." The authorities in Rome acknowledge that the return of Michael's eyesight is a miracle unexplained by any natural phenomenon and worked by God through the intercession of his handmaid Sister Miriam Teresa Demjanovich. On Saturday, October 4, 2014 at 9:30 in the morning, her Beatification will be solemnized at the Cathedral of the Sacred Heart in Newark, New Jersey. If you read the dates carefully, once again you may be puzzled by the timing. Why did it take fifty years after the miracle to beatify her? The answer is this. The miracle was carefully studied and documented at the time - it was then misfiled! The file was rediscovered in 1998, thirty years later. It seems that Sister Miriam Teresa was just as self-effacing after her death as she was during her life. She wanted her writings to point us toward God, not toward herself.